Cecilia Thibes was born in Parana, South of Brazil. Art manifestations have always been a part of her life. Since Cecilia Thibes earliest memories, she felt challenged to grasp the essence of art and its various possibilities. Something that absorbed her inner self and engaged her on a long intellectual and practical research. In 1986, the artist chose to study Anthroposophy at the Studiumjahr Goetheanum Institute, in Dornach, Switzerland, which would impact and influence her carreer for many years into the future. After living for a time in Europe, Thibes went back to Brazil and participated in two advanced training programs within the Athroposophical Artistic field. One of the paths that caught her interest and later became part of her soul and career was Artistic Therapy, at the Artistic Therapy Program at Paulus Center and the other was painting, drawing and composition, at the Art Center, both In São Paulo. 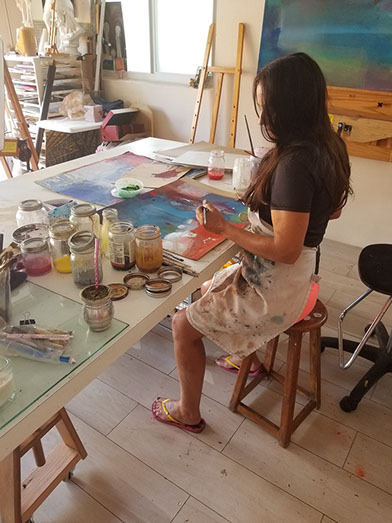 Because of all her deep life experiences with art connection, her atelier has been an active space for work as an Art Therapist, Art Teacher and Painter. It is also a place where the artist has a permanent collection of her art work.